INGÉROP group has contributed to various phases of this project in the center of Paris. 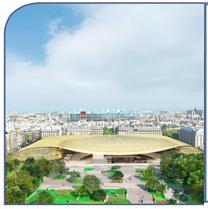 Currently under construction, the Canopée des Halles in Paris has prompted the Group’s Head Office Team to put together a multidisciplinary structural and envelope team working alongside the architects, and experts on an entirely computerized complex geometry, to set up a virtual laboratory. Railway equipment designs as well as a specific mission of railway integration, project management and interface control. 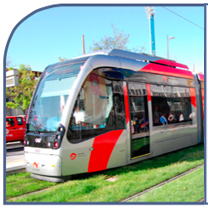 The project consists in a 5km-long tramway line and two cable car lines linked to it. 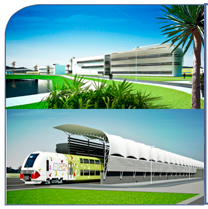 INGEROP is in charge of the project at different stages of its development: initial re- view of the already existing Construction Project, pre- paration of bidding documents for Metro de Medellín and subsequent on-site Project Management and Tech- nical Assistance during construction and commissioning. Geneva’s international airport (AIG) has selected a Joint Ven- ture composed of Rogers StirkHarbour & Partners / Atelier d’architecture Jacques Bugna / Ingéropand their partners, including Géos (INGEROP subsidiary in Switzerland) in order to design and supervise the construction of the new EAST wing terminal building. Hautepierre Hospital in Strasbourg chose INGÉROP in asso- ciation with Groupe 6, architectural representative, as pro- ject manager for the medical-technical locomotive service and the Regional Cancer institute. Global investment: 143 M€. Andra has awarded to Gaya Group composed of Technip and Ingérop the CIGEO project design for industrial geological disposal centre. A consortium led by NucAdvisor together with Ingerop Inter- national and Jordan partners has been chosen by the Jordan Atomic Energy Commission (JAEC) as owner’s representa- tive for the construction of the first Jordan research reactor which is being built at the Jordan University for Science and Technology. The contract, worth five million US dollars (3.8 million euro) over 41 months, is to provide professional ad- vice at each step of the reactor project, from design review to construction supervision. INGA’s G23 turbine is again generating electricity. 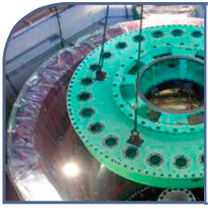 INGÉROP International Consultants managed to successfully carry out a major refurbishment project on INGA’s G23 turbine.